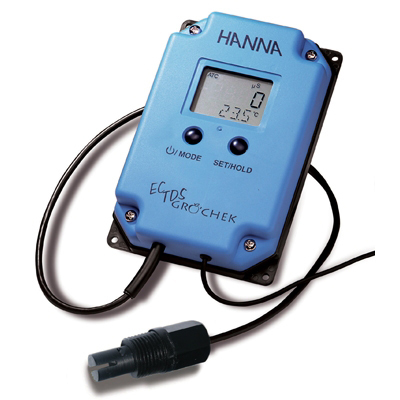 The Hanna HI-991401 pH & Temp wall meter c/w pH electrode, Featuring an extra large LCD dual level display, this wall mounted meter gives a continuous readout of pH and temperature. The display itself is backlit to make it easy to read in low light conditions, or at night. The case is protected against water and dust with an ultrasonically welded LCD display window and rubber keyboard for the controls. Easy to use, the meter automatically recognises 5 different buffer solutions and also has an automatic calibration feature and pH stability indicator. Temperature is automatically compensated for using a temperature sensor which is included in the meter specification. The pH electrode is included in the price and is designed to last as long as possible in solutions with a high concentration salts/chemical compounds. A double junction construction and Teflon diaphragm reduce clogging and prolong operational life of the electrode. A 12volt mains power transformer is included in the price, but the meter can be run from another 12 volt source (such as a car battery), if mains power is not available. Simply install the Hanna pH/TDS/Temperature Monitor (HI-981504) above the sample to be tested, plug the instrument in and immerse the probes. pH, TDS and temperature measurements will be simultaneously displayed on three backlit LCDs. Users can easily select the temperature unit through a switch on the back panel. The HI-981504/5-02 uses a 0.5 TDS factor. HI 981504 has been designed for continuously and simultaneously monitoring pH, TDS and temperature. Simply install the HI 981504 above the sample to be tested, plug the instrument to the mains and immerse the probes. pH, TDS and temperature measurements will be simultaneously displayed on three backlit LCDs. The user can easily select the temperature unit (°C or °F) through a switch on the rear panel. The Hanna HI 1286 gel-filled pH electrode is provided with a waterproof sheath to protect the BNC connector. The unique design of the electrode provides longer life even in aggressive solutions. The HI 7634 TDS probe is easy to clean and requires little maintenance. Measurements are accurate and the meter can be calibrated at one or two points for pH, and at a single point for TDS. Temperature range is factory calibrated. 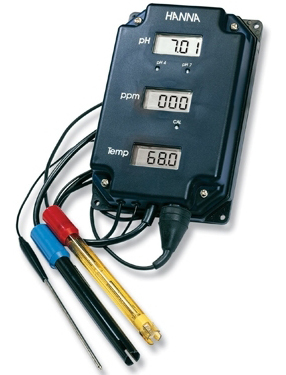 Simple to install (just hang it on your wall), and easy to use, this meter provides a continuous readout of conductivity and total dissolved solids together with temperature of the sample. The meter case itself is fully protected against water ingress meaning it can be mounted in a greenhouse or other similar damp environment without risk to the electronics. The HI-993302 is supplied complete with 12.88mS/cm calibration solution sachet, 12VDc adapter and instruction manual. 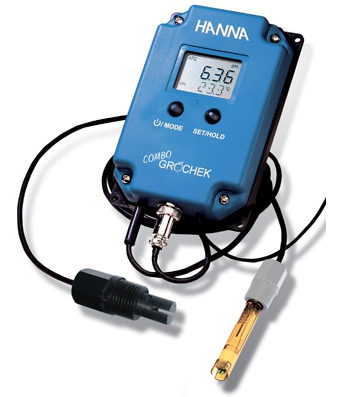 The wall mountable Hanna Conductivity/TDS & Temp Monitor meter has a large, dual-level, backlit LCD and displays instantaneous readings of both EC/TDS and temperature. Waterproof and chemically resistant, the HI 993302 have been designed to meet the need for equipment suited to the aggressive environments found in agricultural and hydroponics applications. At startup, the HI 993302 perform a self-check to assure proper working condition. These powerful instruments also feature a stability indicator and hold feature that prompt the user when to freeze the display and take the reading. HI-982401 ORP (Redox) Wall Mounted Indicator is a simple to use and operate wall mounted indicator gives continuous digital readout of the ORP (also known as Redox) values being measured. The front cover incorporates a bright Red LED light as the visual alarm. Should the measured value fall below the user selectable ORP value, then the alarm light will flash to alert the operator that the alarm point has been exceeded. The HI-982401 has been designed to serve as an ORP monitor where time, space and money are all limiting factors. Thanks to the compact size, the meter together with an ORP electrode can be mounted right next to the chemical dispensing container. Supplied without sensor (please see recommened accessories below), but with the 12volt power adaptor. 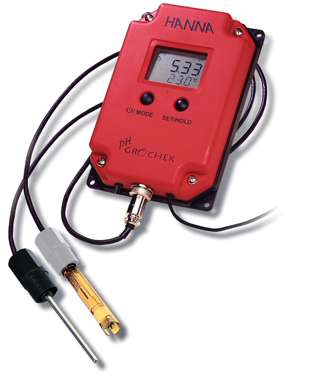 The pH Pronto is a waterproof pH meter with a built-in digital LCD.The meter is supplied with a double-junction, plastic body, gel-filled pH electrode with a 2m cable and a BNC connector, which is protected by a waterproof sheath when fitted to the meter. The electrode has a unique clogging-resistant Teflon diaphragm. One setpoint can be selected in the 3 to 11 pH range as an alarm point. A red LED warns the user in the event the reading falls outside this setpoint by more than ± 0.5 pH. Calibration can be performed manually at 1 or 2 points using pH buffer 4 and 7 solutions. With its IP67 and NEMA 4 protection, the meter fits well in outdoor installations and high humidity environmnents.The casing has also been specially designed to give maximum stability and prevent rolling from any surface. In addition,the moulded hook allows the meter to be easily installed on a wall and close to the Aquarium itself. The 12 VDC power supply is ideal for continuous monitoring over extended periods of time. The meter uses a 12 volt power source which can be from a car battery or similar, or from the mains using a 12volt transformer which is included in the price of the instrument. A box of 10 sachets. 5 of pH 4.01 buffer solution and 5 of pH 7.01 buffer solution. Each sachet contains 20ml of solution and can be used to calibrate any of our pocket meter range, or any pH meter with a conventional pH electrode. The Hanna pH & ORP Continuous Indicator HI-981406 features separate displays for continuous readout of both pH and ORP (also known as Redox). The meter uses a 12volt power source from the mains using a 12volt transformer which is included in the price of the instrument. Also supplied with an earthing pin to ensure that readings are correct and not affected by a lack of earth within a plastic or other form of insulated tank environment. Designed for aplications where both the pH and ORP need to be monitored, it provides an economic solution to the problem of having to buy 2 separate meters to do the same job. In addition, it incorporates 2 red LED alarm lights which illuminate when an alarm point is reached. These alarm points can be set by the operator and serve to alert when there is a problem in the pool water. The meter will accept any type of pH electrode or ORP electrode fitted with a BNC connector, but we recommend the HI-2114P/2 pH electrode and the HI-3214P/2 ORP electrode in the accessory section below. Both of these electrodes are specially designed for applications and feature a purpose-built fibre salt bridge junction which is particularly resistant to clogging in water.